Silver increased $+0.78 this past reporting period and gold ended up $+37.90 but do you know how they got there? Here are the CME Daily Bulletin reports from yesterday, ending the Commitment of Traders reporting period of March 21st – March 27th. Notice the Most Active Volume Month (MAVM) is red and the 2nd Most Active Volume Month (2MAVM) is green. In gold, the MAVM is April and the 2MAVM is June, with the month of May in between them. In silver the MAVM is May and the 2MAVM is July, with no month between them on the report. 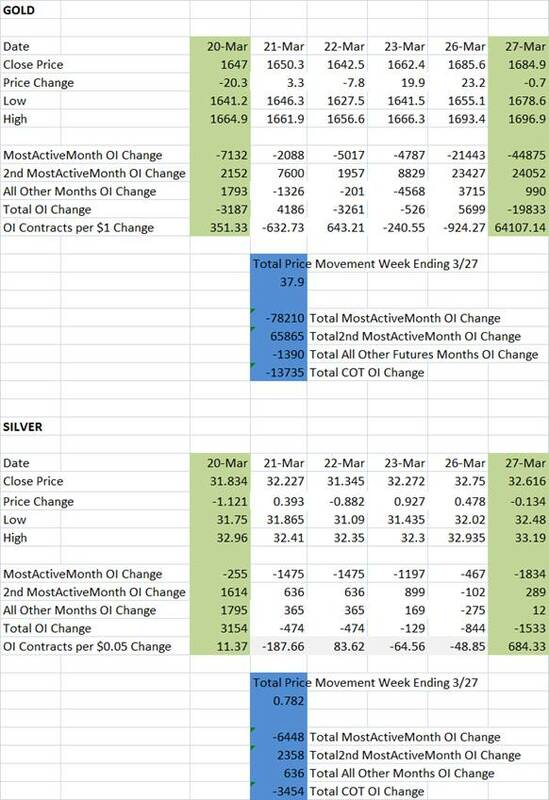 May is reported in gold because there is 664 Open interest contracts in it which hints that some traders will take delivery in May, however May is not a standard trading month for gold. For gold, trading is conducted for delivery during the current calendar month; the next two calendar months; any February, April, August, and October falling within a 23-month period; and any June and December falling within a 60-month period beginning with the current month. Therefore, what we see in gold is there is currently a month gap between trading months, April the MAVM which determines spot price and June, the 2MAVM, which later this week will become the MAVM. In silver, we see that June is not currently listed because it is not a standard trading month. For silver, trading is conducted for delivery during the current calendar month; the next two calendar months; any January, March, May, and September falling within a 23-month period; and any July and December falling within a 60-month period beginning with the current month. Therefore, we see in silver that May, MAVM, and July, the 2MAVM are listed as back to back months. These differences of whether the MAVM and 2MAVM are back to back or not is crucial to understanding the flow of Open Interest and spot price determination for those wishing to understand the technical’s of gold and silver. Notice the MAVM long string of daily negative Open Interest flow. Notice the 2MAVM long string of positive Open Interest flow. Most of the Open Interest from the MAVM is flowing directly into the 2MAVM. You can also see on this chart the flow to or from all other months as well as daily changes in total Open Interest. This is normal when the two most active trading months are separated. Has made me wonder for quite some time how the Bullion Banks and the Speculators manage their daily fight over the spot price and at the same time managing to flow the huge volume into the 2MAVM. The important thing to remember here is that none of the Open Interest in the 2MAVM makes any determination in the spot price of gold until the volume of the 2MAVM surpasses the volume of the MAVM. When there is a reporting gap, like the month of May between the MAVM and the 2MAVM, you will always see this negative flow of Open Interest and it obfuscates the real battle for spot price. The transfer of which month determines the spot price in gold will take place today or tomorrow and I will show you that next week. Interestingly enough, we see a long string of daily negative Open Interest flow in silver as well but it is not nearly the percentage that we see in gold. That might lead us to a conclusion of general market direction for the metals. Clues are everywhere and most of them hard to see! Only March 12 is a MAVM positive Open Interest day. Notice that the 2MAVM is split between negative and positive days. 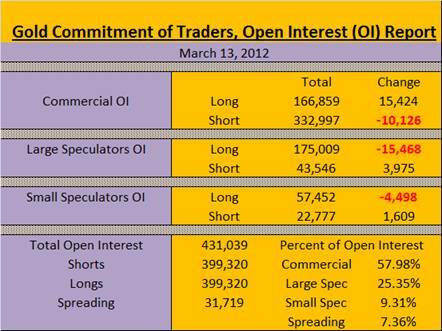 Notice that the total OI change is also split but is mostly negative. Before I showed everyone all the negative flows, I would bet that 99 out of 100 silver stackers would have said that on the days that silver price goes up that the longs have added contracts to their totals and are winning the battle and on the days that silver price goes down the shorts have added contracts and are winning the battle. 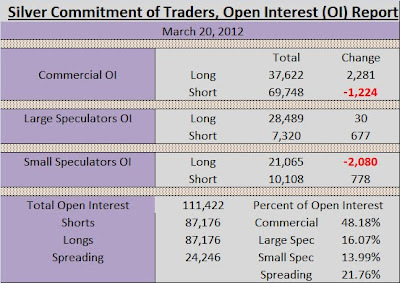 Well, that is mathematically correct in that either longs or shorts are winning the battle on any given day, but, not numerically correct as we can see on March 23rd, a day when silver price went up $+0.92.7 the actual MAVM Open Interest flow was determined by a -1197 contracts leaving the MAVM. That is where it gets quite mathematically fascinating! The total volume for silver on March 23rd was 42963 contracts traded and the subset of volume in the MAVM was 36574 contracts traded. The answer is that 99% of the traders cannot determine where the spot price is going on a day like March 23rd. But guess who can determine it? You guessed right. The Bullion Bankers. Only they, before, during, and at the close of the trading day know where the spot price is going to wind up. In silver, we know JP Morgan is by far the largest player, with 1 or two other Bullion Banks also playing but in far less quantity. After that there are hundreds of traders of far much minute size who are just along for the ride hoping they have some insight as to whether price will rise or price will fall. 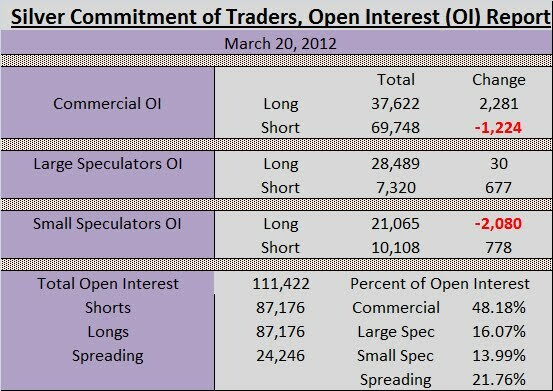 Please remember that those hundreds or thousands of traders all act independently of one another and in silver only represent 30% of Open Interest while the few traders who seem to act congruently represent 48% of Open Interest. 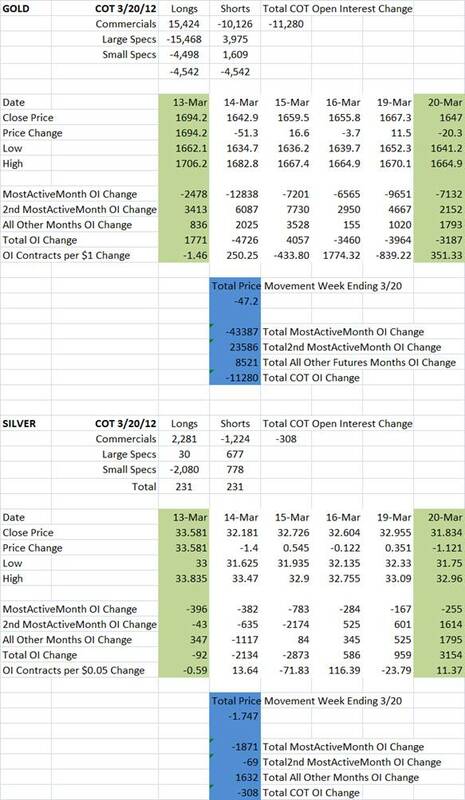 See my COT chart, for last week, below. Remember, these markets are absolutely rigged!! PS As always, this week’s and last week’s COT spreadsheets are at the bottom.